One of the things I knew when opening up my store was that the fantasy would be greater than the reality. Meaning my dreams and hopes would be countered by reality. My customer base would be made up of largely unknown new people. The customer base keeps on changing. One of our best customers has disappeared. No responses to my calls or emails. Had to put the comics he had in his pull box back and hope that everything is alright for him. My favorite Magic player moved out of state. With school starting it will be interested to see who we gain as new customers. 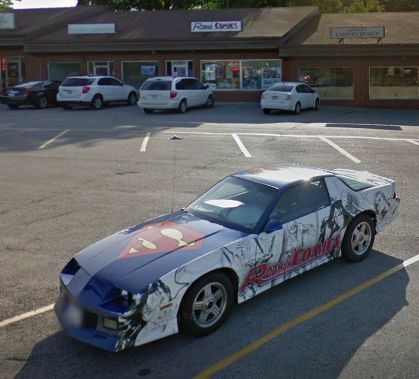 Yet another local comic store has fallen here in central Iowa, Capes Kafe. It was located in downtown Des Moines. Over the years for central Iowa, that is three down in a row with no new comic stores opening around here to my knowledge. Rodman Comics is coming up on its 8th anniversary in October. I will admit I am slightly superstitious. 8 is my bad luck number. Right now things are not looking super great on the comic and gaming side of the business for us. Meaning comics still seem to be waiting to get hot. Magic the Gathering has made some recent changes that will not benefit us. We are not losing money, just not seeing amazing growth happening anytime soon. Back in February if my memory is correct I wrote about how we were doing alright and had cut expenses and had a good amount of money on hand. I went ahead and expanded staff, usually I try to not read the comments on Bleeding Cool about what I write, I did that one time and a person left a comment to the effect of ‘don’t do it, take the money and run’. Turns out that person was correct. I keep hoping and wanting to see the comic market come to life, though so far it has not. Hoping to see more titles from the big two that will actual sell. Iceman came out and we sold one copy. Why did it sell? One of our customers wanted the Scottie Young variant cover. Marvel also double shipped it to us. Which was quite unnecessary. Diversity is important. Comics shouldn’t be just about white straight males. What I take issue with is Iceman had already been cancelled not long ago and this book looks similar to the cancelled series. Granted this time it is a limited series. Iceman being gay and being outed by the young Jean Grey was questionable. Did she have the right to do that to him? To make that call for him? Regardless, as a retailer, I would have more support for having a different gay character that has not been used as much recently such as Northstar get his own series or limited series over another Iceman publication. Northstar has been around for a while and had a big push in Astonishing X-Men when he got married. Now Northstar is unused while Iceman shows up quite often in various titles. Iceman even showed up in the latest Fantastic Four issue. Right now I feel there are more titles out than there is decent talent available. For diversity to become bigger in comics there needs to be talent on the book featuring a diverse character to get people to pick up the title, or any title for that matter. In past years, the number one selling comic book in America was Spawn. Albert “Al” Simmons was not only Spawn, he was African American. Todd McFarlane who was super popular at the time came off his popular Spider-man run and created Spawn. Marvel seems alright not giving readership what they want. Inhumans, for goodness sake, were cancelled so many times over the years. From All New, Uncanny, Royals, and more they kept coming back just to get cancelled again. It is an insane business plan to keep bringing back what isn’t selling. Now the Inhumans are getting killed in the Death of the Inhumans limited series. As a retailer, I went from liking the characters to now seeing the limited series as a mercy killing that hopefully will allow enough time without them being published to actually happen so readership can actually miss these characters and give Marvel time to find a good creative team for the characters for when they come back. I do not for a moment believe the comic industry is coming to an end. For many years naysayers have been saying the comic industry would end and it has not come true. In other countries, the comic industry is doing fantastic. I just wish the comic industry here in America would take note of how well comics sell overseas and do a far better job attracting more readers. I have heard and read about people complaining about their customer service at other stores or other retail businesses. The job market is tight. Finding someone that wants to learn and be productive and good at their job is currently challenging. Come November I plan to hire another person who I know and feel will be a good fit for the store. If only it was as easy to throw a bunch of money at someone and get a great employee. People have come in to apply with the oddest of reasons thinking they would be a good fit for the store. One person who came in had never collected comics, played card games or any of the games in the store but wanted to work at a comic store. Why did this person think they would be a good fit? Because they had seen the TV show, the Big Bang Theory. For better or worse the Big Bang Theory did paint a picture to non-comic fans about what a comic store is. Which, on the show, is usually as a place where hardly any business happens. Not exactly a positive image for comic stores. I do enjoy when the cast visits the comic store and I will check out all the items on display thinking those are so cool. Over the years a lot has changed. I have had private showings for the various comic related movies. At first, it was mostly the honor system where people pay me back for going. People would stop in after the movie and pay for it. At the time it was a good way to get people into the store. If over fifty people had seen the movie, then afterwards over fifty people would stop in. As the years went by, fewer and fewer people stopped coming on in the day of the movie and more people started taking more and more time to pay. One person Facebooked me, saying him and his family still owed me for the first Ant-Man movie. I got smart and started having people pay at the movie theater. Our local theater was recently bought and I have been informed no more free posters and that we must hit x amount or I pay for the difference. Which I completely understand. With it being an event for our customers, I never know how many people will make it. Meaning, such things like if it rains, that will increase the amount of people that make it because their kids’ sporting event was rained out so now they can make it. Venom, on the morning of October 6th, will be our last private showing for a movie. Aquaman in December would have been the next one, though with the holiday season it could mean a lot more people from out of town seeing the movie with family members or the opposite where our customers are out of town visiting others. Too much of a gamble. Of course, I forgot the Venom movie when planning the anniversary of the store and will end up having both on October 6th. Usually the morning before an anniversary or Rod Deals we use the time before opening to get ready. Which means Friday night during Friday Night Magic we will have to get ready instead. Hopefully we can once again, one final time get people from the movie to show and check out our sale that day. Changes happen no matter what we do. For the store’s anniversary I ordered cake for it. Best cake I have ever had. It was so good, people would ask if we were having the same cake again each year. People loved it. The cake place went out of business. Weird right? How could a business that, year after year, put out a good product go out of business? Lots of possible factors, sadly. I only used them once a year. Meaning, how many times a year does a person or business order cake? This year, people were recommending using a chain grocery store for the anniversary cake. Many people play it safe and order from big name chain grocery stores. I, of course don’t do that, since I am a small local business and do use other small local business when I am able to. It is how I found the total awesome cake place. That said, I was surprised that out of the multiple small local bakeries that I contacted only one got back to me. So, that is the one we are going to use. Come October 6th, we will see how much of a hit they are with our customers. Over the years it has amazed how I try to for every sale and when dealing with other vendors or businesses it almost seems insane that they could care less if I buy something from them or not. I was getting calls daily for a while from a major soda distributor about using them to stock up our fridge since we sell soda and water. Currently, I do it myself. It was almost perfect timing after over six years our fridge went out. They said they would supply the fridge. I had a customer that works for the soda company who was trying to make sure it worked out. I signed a contract. Never received the fridge. Called and was told they cancelled the order and did not have a reason. Kept trying to get them to supply a fridge. Then it all went the opposite from when they were calling the store daily to not returning our calls and even telling me to quit trying to have my customer check on the fridge that works for them. My employees were even confused by the sudden change. I ended up buying another fridge and stocking it myself again. So many times when dealing with other businesses I think if I did this to my customers we wouldn’t have any. This year DC came out with exclusive content for Walmart while including reprinted material. Some retailers were upset. I was and still am fine with it. As I stated before Walmart isn’t going to be known for excellent customer service and selling near mint copies of comics. Bought some and resold them at the store and online. They are now plentiful here in central Iowa and from talking to people around the country if their Walmart carries the comics they are now easy to get. They are very easy to get online. The whole including exclusive content to get regular comic collectors to be interested in them while packaging reprint material with the exclusive content to attract collectors that have most likely already have read or are not interested in seems counterproductive. No brand new comic fans have stopped in thanks to the Wal Mart exclusives. After some time goes by and the current writers on the exclusive content are done it will be interesting to see how long it continues. I will admit I have read some of them and the reprinted material in them at times makes me wonder if artists were better years ago than they are today. Over a year has passed since we put in new carpet. Did buy some more glass displays this year. Managed to make it to Vegas for a vacation. Already have my new year’s resolution for 2019, to travel more. I love the store and everything though just like one loves their kids a break once in a while is needed. Working too much. Planning our next sale, Rod Deals for October 6th. A Magic Pre Release will be going on September 29th and 30th. The set the Magic players keep jokingly call “The Return to the Return of Ravinica” due to Ravnica having been used so many times now. Some worry if Wizards of the Coast, the makers of Magic the Gathering is running out of ideas. There will be a prerelease for Heroclixs next month. Also, planning out two more sales before the end of the year. It is a shock but, the year has less than four months left. Also in October a pre release for Heroclix, Battleworld. The set so far has heroclix players excited. Over the years I still set goals for the store. Such as for the anniversary of the store to have the biggest sale day we have ever had. Meaning dollar amount sold record. I am going to give it a good try. I also will try to make sure Rodman Comics is around for years more.